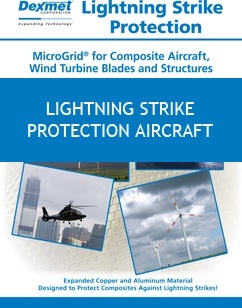 Our copper and aluminum MicroGrid® materials protect composite aircraft surfaces and rotor blades from lightning strikes. Aluminum has been the principal material used in aircraft and aerospace construction for the past 70 years. With the growing interest to construct more efficient aircraft, manufacturers are designing more components out of light-weight composite materials. The new generation of aircraft utilizes carbon fiber for major structures including the fuselage, wing, engine nacelles, flaps, wing tips, and even rotary blades and fuselage on helicopters. Composites, however, are poor conductors of electrical current. Without proper protection, they are susceptible to severe damage in the event of a lightning strike. When Dexmet expanded aluminum and copper MicroGrid® materials are incorporated into the surface of these composite structures, the lightning strike energy is dissipated over the surface of the component, which prevents damage to the composite material below. 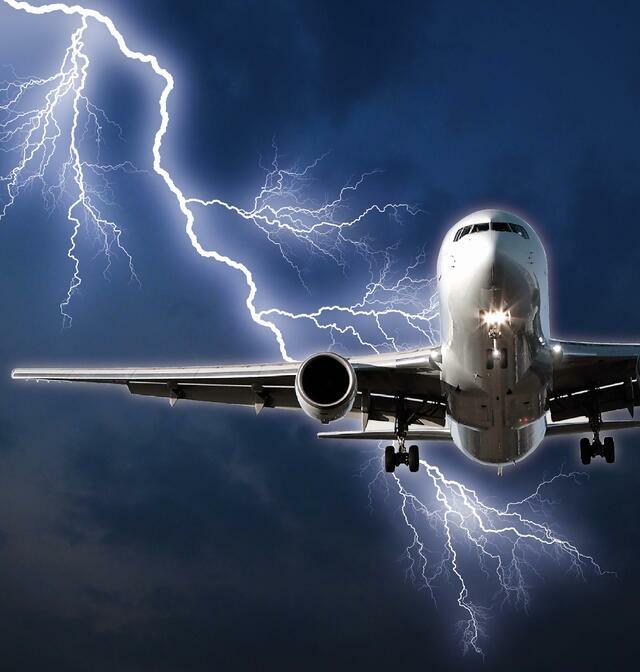 MicroGrid® precision expanded metal foils from Dexmet are the materials of choice for lightning strike protection in composite aircraft structures. We've been developing the technology for the last 30 years with all major aircraft OEMs and we have the most configurations available in the industry. Dexmet is the preferred supplier on many of the new generation designs for Airbus, Boeing, Bombardier, Embraer, and the majority of aircraft and rotorcraft manufacturers around the world. Aircraft manufacturers realize the benefits of using Dexmet’s advanced expanded materials over the outdated technology of woven wire and come to Dexmet for technical knowledge when designing new components. MicroGrid’s single unit structure is superior to woven material in that it won’t unravel or have loose strands that become problematic during processing into a pre-preg material or when conducting a dry lay-up. The homogeneous design also ensures uncompromised conductivity between strands when forming the material to a variety of shapes and contours and provides a smooth surface on the end product. MicroGrid’s biggest advantage is Dexmet’s ability to tightly control the manufacturing process to meet a specific weight, open area, and conductivity requirement. This allows engineers the option of varying materials according to specific strike zones on the aircraft, minimizing the overall weight. Our common materials have the ability to withstand a Zone 1A strike of 200,000 amps. An aircraft is divided into zones of severity of potential lightning strike damage. 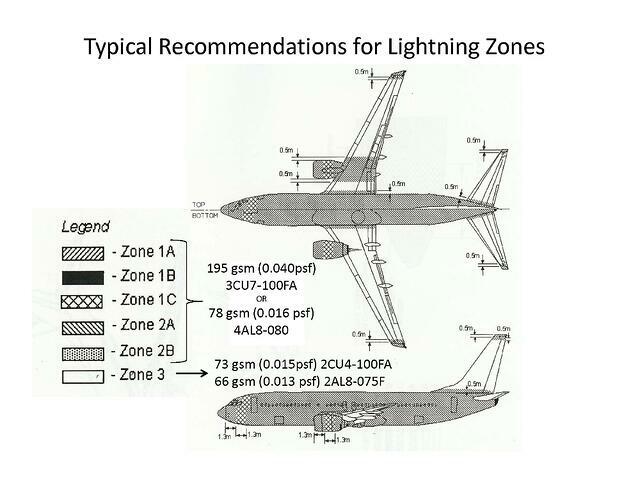 The two most severe categories of zoned lightning strike damage are Zone 1A-1C requirements per SAE ARP5414. Below are charts of the most typically produced materials for lightning strike protection in composite aircraft structures for Zones 1, 2 and 3. Over rivet lines, lightning strike testing has determined that weights greater than 400 grams per square meter are better at dissipating sparking from embedded rivets. To learn more about the benefits of Dexmet’s expanded MicroGrid® materials, its lightning protection performance, and how it can reduce your maintenance costs and downtime, download our guide. Let us show you how to incorporate our innovative expanded materials into your composite designs.